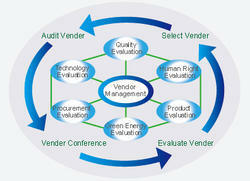 Our range of products include vendor management software. We take pleasure in introducing ourselves as the leading firm by offering Vendor Management Software. This Retail Management Software is rendered utilizing a systematic approach to ensure perfect execution. Our expertise team members carefully plan every step before execution. The features of this Software are User-friendly Classification Ability to monitor and forecast the movement of goods Centralized data can be accessed through sales pro Tracking the information flow and Material flow Monitoring the sales forecast Improve the workflow Reports.